The following article was orginally circulated in the staff bulletin. 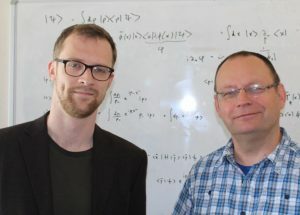 Two Theoretical Physics Lecturers have just returned from China after sharing their research with a number of high-profile organisations. Dr Ben King gave lectures on strong field physics at the National University of Defence Technology (NUDT) summer school in Changsha, and was also invited to collaborate with researchers at the China Aerodynamics Research and Development Centre (CARDC), where he spent one month working on quantum electrodynamics in intense fields. Meanwhile, Dr Tom Heinzl went to Shanghai to present his research and sit on the committee of an International Review Meeting thanks to sponsorship from the Shanghai Institute of Optics and Fine Mechanics (SIOM) and the Chinese Academy of Sciences. The meeting’s purpose was to discuss and review the scientific opportunities for the ‘Station of Extreme Light’ (SEL) at the Shanghai Coherent Light Facility (SCLF), and explore the conceptual design and technical approach towards a 100-petawatt laser.